Facebook has announced that users will soon be able to login to third-party apps anonymously, in order to address privacy concerns. 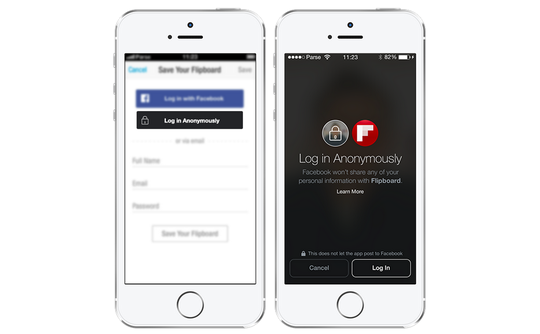 Unveiled at Facebook's F8 developer conference, Anonymous Login will enable users of the social network to hide personal information from app developers, with Facebook saying that the new process aims to get people using apps they might not necessarily fully trust yet, such as Flipboard. Facebook said, "People tell us they're sometimes worried about sharing information with apps and want more choice and control over what personal information apps receive. Sometimes people want to try out apps, but they're not ready to share any information about themselves. "For this, we're introducing a way to log in to apps anonymously. Anonymous Login lets people log in to apps so they don't have to remember usernames and passwords, but it doesn't share personal information from Facebook. "People can decide later if they want to share any additional information, once they understand more about the app." Anonymous Login is being tested by a handful of developers, and will be opened to more app makers in the "coming months". Facebook also unveiled a new version of its standard login at F8, which again addresses ongoing privacy concerns with the ability to select which data is shared on the social networking website. "For example, if someone wants to share their email address with an app, but not their birthday, they can make that choice with a couple taps," Facebook explained. Facebook founder Mark Zuckberberg also announced a redesigned control panel for easier management of permissions, along with the news that the website will start reviewing apps to ensure that developers aren't posting to a user's Facebook wall without their explicit permission. The 2,000 developers weren't just treated to a barrage of new tools, as those in attendance at Facebook's F8 conference were each given a Raspberry Pi computer in their goody bags.